I love salads, but I often tire of the same old salad recipes with the same old salad dressings. This delicious Spicy Green Salad Recipe I learned from my father-in-law, who makes the most amazing salads I’ve ever had, with just the simplest of ingredients. Full of fresh herbs, crisp romaine lettuce and spicy jalapenos, this low calorie salad definitely does not lack flavor! And rather than using a pre-made bottled salad dressing, I made my own with just a few ingredients, and I truly believe that it tastes much better than any other salad dressing. Each serving of my Spicy Green Salad is just 1 Point, and makes a great low Points accompaniment to many different Weight Watchers Recipes. This unique Spicy Green Salad recipe is not only delicious, light and healthy, it’s lovely to look at and goes well with many different low calorie meal ideas. 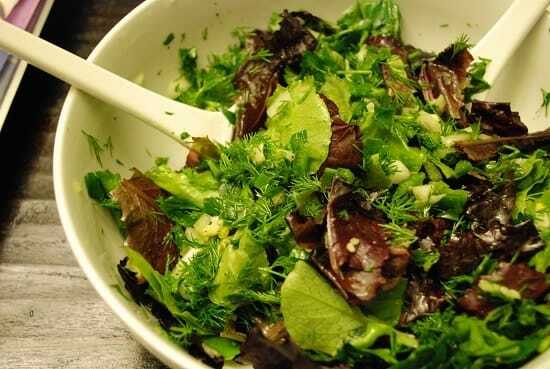 In a large bowl combine lettuce, dill, parsley, onion and jalapenos. Toss well. Add in garlic, olive oil, lemon juice, salt and pepper. Toss well to combine. The jalapeno and the fresh dill really makes this salad different from the norm, imo. I would not skimp on those ingredients! This salad looks so pretty & yummy, but I think I’ll try it without the jalapeno. I love the jalapeno kick – what a terrific idea to add punch to the same old salad!